Halotestin is an oral steroid which was introduced on the market by Upjohn Company in 1957. Its fluoxymesterone substance is precursor of methyltestosterone which, through changes in the chemical structure, was made much more androgenic than testosterone. The anabolic component of Halotestin is only slightly pronounced. Based on its characteristics Halotestin is used mainly when the athlete is more interested in a strength build up rather than in a muscle gain. Powerlifters and weightlifters who must stay within a certain weight class often use Halotestin because they are primarily interested in a strength gain without adding body weight. In bodybuilding this drug is almost exclusively taken during preparation for a competition. Since the substance is strongly androgenic while at the same time aromatizing very poorly, Halotestin helps the athlete obtain an elevated androgen level while keeping the estrogen concentration low. With a low body fat content Halotestin gives the bodybuilder a distinctive muscle hardness and sharpness. Although the muscle diameter does not increase, it appears more massive since the muscle density is improved. The fact that daily dose of up to 20 mg does not cause water and salt retention makes it even more desirable. During a diet, Halotestin helps the athlete get through difficult, intense training while increasing the aggressiveness of many users. This is another reason why it is so popular among powerlifters, weightlifters, football players, and, in particular, boxers. The generally observed dose is normally 20-40 mg/day. Bodybuilders are usually satisfied with 20-30 mg/day while powerlifters often take 40 mg/day or more. The daily dosage is usually split into two equal amounts and taken mornings and evenings with plenty of fluids. Since the tablets are l7-alpha alkylated, they can be taken during meals without any loss in effect. Those who are tired of taking Dianabol tablets will find Haloteslin an interesting alternative. In the meantime we know several bodybuilders who have combined Halotestin with injectable, mostly anabolic, steroid preparations such as Anadur. Deca-Durabolin, Primobolan Depot, or Equipoise. The quick strength gain induced by Halotestin can usually be turned into solid, high-quality muscle tissue by taking the above steroids. This is an especially welcome change for athletes who easily retain water and have to fight against swollen breast glands. Many will be surprised at what progress can be achieved by a simple combination of 30 my Halotestin/day and 700 mg Equipoise every two days over a four week period. Besides Anadrol 50 and Methyltestostcrone it is the oral steroid with the most side effects. 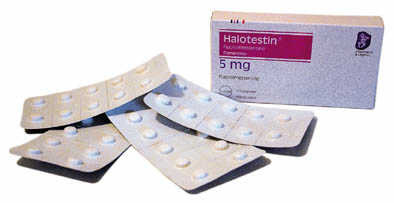 Those who would like to try Halotestin should limit the intake to 4- 6 weeks and take no more than 20-30 mg daily. Fluoxymesterone puts extremely high stress on the liver and is thus potentially liver damaging. Other frequently-observed side effects are increased production of the sebaceous gland (which goes hand in hand with acne), nasal bleeding, headaches, gastrointestinal pain, and reduced production of the body's own hormones. Men become easily irritable and aggressive. Gynecomastia and high blood pressure caused by edemas do not occur with Halotestin. Do not be surprised, however, when on Halotestin's package insert you read the words "gynecomastia" and "edemas." 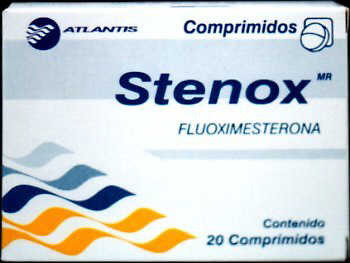 This standard warning, due to legal provisions, is included in all strong androgenic steroids. Women should avoid Halotestin since it can cause substantial and in part irreversible virilization symptoms. Halotestin is rarely found on the American black market, sometimes the Italian, Greek, or French version of Upjohn shows up. The 5 and 10 mg tablets are very expensive. One hundred 10 mg tablets cost approx. $100 on the black market. A strip with ten tablets of 5 mg each in a French pharmacy costs 39 francs, equal to approx. $8. The Italian Halotestin costs about the same but contains 20 tablets. The Italian and French Halotestin tablets are all indented with the UPJOHN imprint on the back.